Wenner’s unique and innovative use of anamorphic perspective creates unforgettable images that combine the painted surface with its surroundings into a single composition. After the interest shown in a former article on Julian Beever’s anamorphic pavement paintings, I decided to complete it with more materials on the topic. 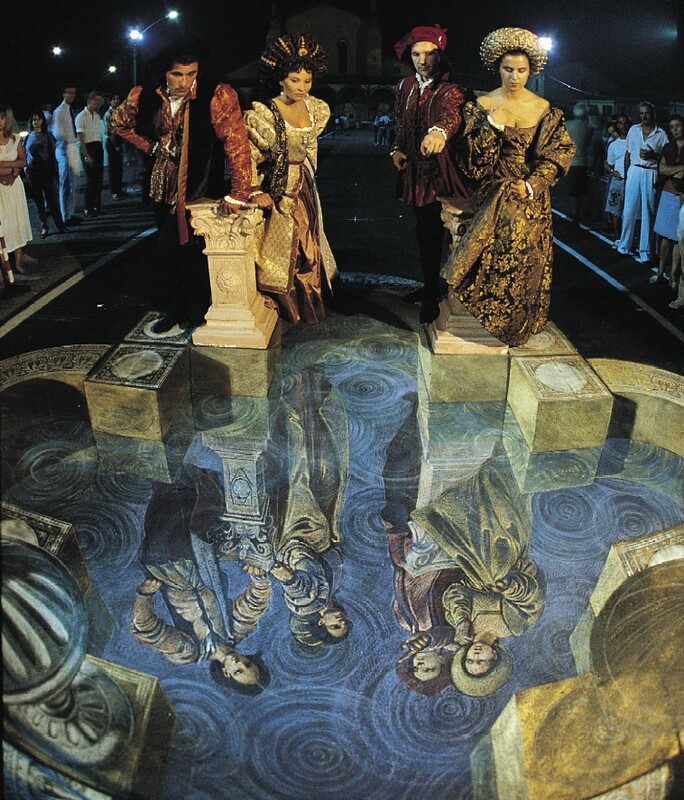 Julian’s site included several pictures of his chalk paintings, but I remembered to have seen some more, so I made a little research to see what I could find -and I found myself surprised by the (re)discovery of another great painter and master of the anamorphic technique, Kurt Wenner. I say rediscovery because in fact I already knew several of his pictures, though I thought they belonged to Julian; actually, besides the fact that they use similar methods, it’s easy to see differences between them. Both of them are figurative, and draw the contours of the shapes they paint. However, if Beever tends to paint contemporary and often quotidian people and objects, Wenner’s imagery is neoclassical, in between Renaissance and Baroque. My favourite paintings of his are those where he works the scenography and composition in order to enhance the pathos, giving the pictures a strength that outperforms that of Beever… yet Julian has got a sense of humour, a “human touch”, which make his paintings great even when the subject is not. In other words: Human people in a picture by Wenner tend to become objects, statues in the picture. But when Beever poses with his creations, he brings them out to the world. Anamorphic illusions drawn in a special distortion in order to create an impression of 3 dimensions when seen from one particular viewpoint. Julian Beever is a very special painter. He has mastered the technique of anamorphic painting, which he applies to pavement paintings to render awesome, stunning images that pop out of the floor. Anamorphic painting has been used since the Renaissance; great examples are the ceiling and cuppola of St. Ignatius, by Andrea Pozzo, in Rome, or “The ambassadors“, by Holbein. However, what I like of Julian Beever is not only that he literally brings the technique to the streets, but also the sense of humour that he shows when he poses with his paintings. Posted on [30.11.05] [23.11.16] Author joseCategories imageTags art, paintingLeave a comment on Guess what, guess who? Ichung has always loved my bamboo paintings. I always paint them to unburden myself. I’ve never had the purpose of reproducing their appearance. I don’t mind whether they have many or few leaves, that their branches are straight or crooked; I limit myself to give brush strokes. The people say that they look more like rushes, or ropes, or any other thing; I don’t manage to make them see bamboos or have interest in my paintings. They may be right. What I don’t understand very well is why Ichung likes them. The Essential Vermeer provides a wide range of in-house resources for studying the work and life of Johannes Vermeer. This site is simply awesome. It contains a huge amount of information on the great painter: no matter what you’d like to know, you’ll find it here. I wouldn’t know what to highlight, but I found very interesting the articles on the master’s technique and those on the palette he used. If you feel like an expert after all the reading, you can participate in the controversy about the authorship of the recently attributed “A young woman seated at the virginals”. 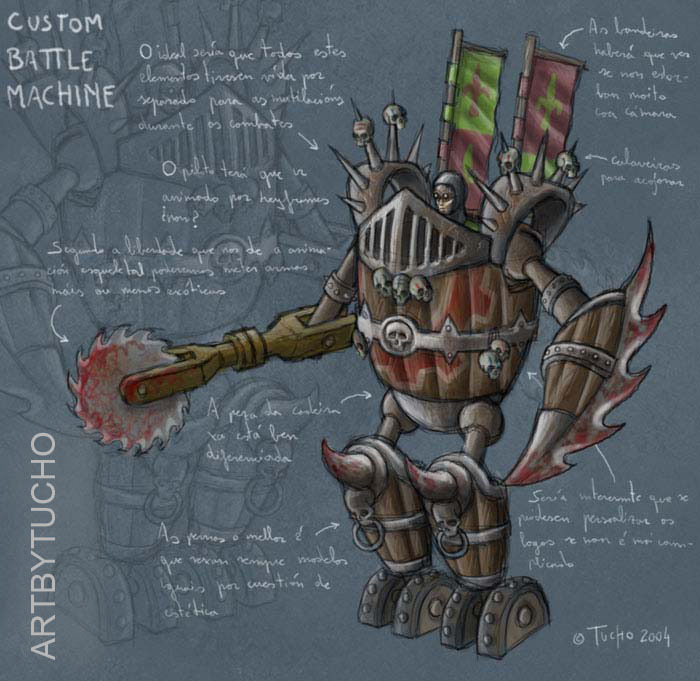 My friend Tucho told me that he was using the books featured in this site to improve his technique, and actually I found them all very inspiring, not only for artists as talented as he is, but for everyone whith an interest in illustration. The page is also relevant since it´s hard to find printed copies of the books. For more info on Loomis himself, you can read his biography here. [Update] In a recent visit to the site this article points to, I found out that the books are no longer available there due to a letter of removal. On the other side, you can now find the books for sale in various online stores, like amazon.com .